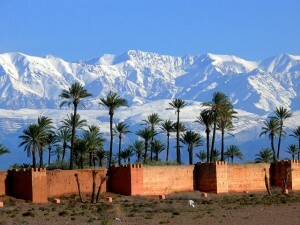 Marrakech is one of the most glorious, vibrant and exciting cities in the world. 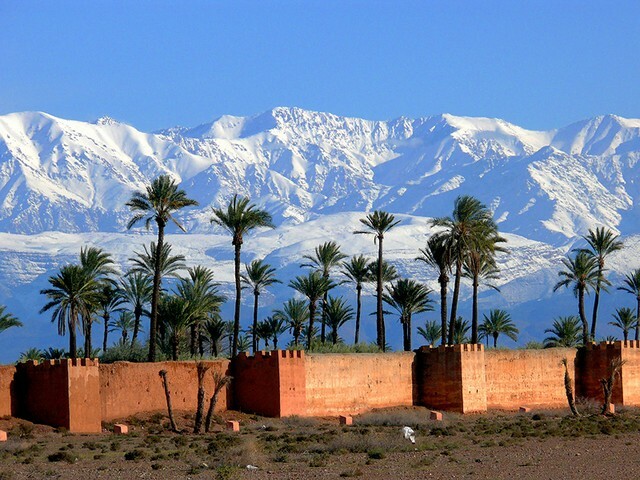 With its splendid and strategically important setting at the foot of the often snow-capped Atlas Mountains it has been envied as the jewel in the crown of Morocco. 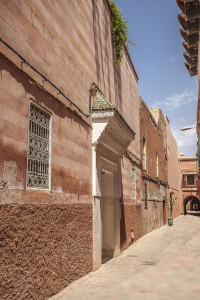 The medina is the authentic heart of the city and Dar El Mudal is situated in a quartier that has an old and honourable history of welcoming newcomers, is quiet and residential, but still only a short walk away from the famous square known as the Jemaa El Fnaa. Many people settled here in the sixteenth century after the expulsions by Ferdinand and Isabella of Spain and the area became known as La Quartier des Andalous. After the Revolution of 1918 it was also home to a great many Russians, and Muslims, Jews and Christians lived in happy harmony together – there was even a Catholic Church nearby. Of course, this area is also known as the Palace Quartier because of its rich concentration of wonderful buildings, from the sixteenth-century Badi Palace (which received a British ambassador from t he court of Elizabeth I at its launch party), to the nineteenth-century Bahia Palace, part of which is open to the public and part still used by the present King for his guests. Dar El Mudal is a real home, created by Gloria Mudaliar Hutchinson and her artist husband, Norman Douglas Hutchinson, with all the warmth and personality you would expect of such. The house has a traditional layout with a spacious and elegant reception area at its heart, five bedrooms and a beautiful roof terrace to relax in. The decor reflects their life-long and eclectic interest in beautiful works of art and furnishings and has many wonderful images painted by Norman. Gloria’s husband died in 2010 but she continues to be a renowned hostess receiving guests with a radiant smile, a ready sense of humour and great pleasure. Copyright © 2015 DAR EL MUDAL. All rights reserved UNIXI.